Scott Lang is grappling with the consequences of his choices as both a superhero and a father. Approached by Hope van Dyne and Dr Hank Pym, Lang must once again don the Ant-Man suit and fight alongside the Wasp. The urgent mission soon leads to secret revelations from the past as the dynamic duo finds itself in an epic battle against a powerful new enemy. Of all Marvel films and superheroes, Ant-Man perhaps the least of my favourite. Although Ant-Man has a very very interesting power and his alter ego character is kind of funny, Ant-Man doesn’t make to my favourite superhero list. But, as all Marvel films are kind of connected to one another, especially after what happened in Avengers: Infinity War (2018), it’s hard to miss one single individual superhero of Marvel. Of course, you can just watch Avengers films without watching the standalone superhero films, but that could make some confusion because the heroes were not introduced anymore in Avengers film. For that reason, I decided to watch Ant-Man and the Wasp. Despite this film being one of the most anticipated films this year by every Marvel film fans, it’s not one of my most anticipated films this year. Therefore, I am not too keen to watch it right on the day it is released. So, let’s start talking about the film. Ever since the released of Avengers: Infinity War’s trailer, everyone has been questioning where the hell is Ant-Man. Why he didn’t join the Avengers or at least Captain America, after what happened in Captain America: Civil War (2016). Of course, they give the answer in the film, though not much I have to say. In Ant-Man and the Wasp, we finally got a clear answer on why he didn’t join the Avengers. I don’t know if the reason made sense or not, but let’s just say it is. I have never seen any of Paul Rudd’s film. If I have, I certainly don’t remember. That is why the first time I watched Ant-Man (2015), I never really expected what kind of character would he be like. Will he be funny or serious or ridiculous or anything else. Well, after watching the film, I now know that he is actually pretty funny. The kind of funny that can entertain you for a good laugh. He is funny in the first film and still funny in this film. I didn’t expect less from him—not that I expect more too. To be honest, I am not a fan of him but Paul Rudd certainly did a good job in portraying Ant-Man a.k.a. Scott Lang. He has a funny side that suits the role of Scott Lang. Scott Lang: Hold on, you gave her wings?! Dr Hank Pym: And blasters. Scott Lang: So I take it you didn’t have that tech available for me. Dr Hank Pym: No, I did. 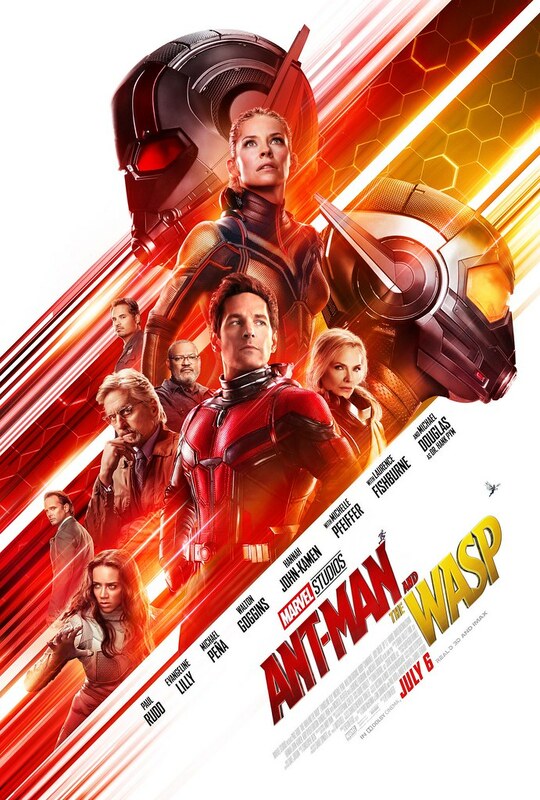 Evangeline Lily is back again, now not only as Hope van Dyne but also the Wasp. Continuing on what happened by the end of the first film, now Dr Hank Pym’s only daughter got her own costume. After kind of feeling jealous with Scott Lang, Hope van Dyne can finally have her own shrinking power. Not only that, her costume is even better than Ant-Man. Why you ask? Well, just the wings already make her costume even better. After all, when you are the same size as an ant, having wings is a perk itself and made you move more easily than depending on an ant or other bugs. After seeing Evangeline Lily in The Hobbits trilogy, it’s not that hard to imagine her doing fighting scenes. She is doing well for that part. As a veteran actor, you don’t have to doubt Michael Douglas’s performance anymore. He is back again as Hank Pym, the smart genius who creates the Ant-Man technology. What’s more exciting to me than seeing Michael Douglas is the fact that Michelle Pfeiffer joined the cast as Hank Pym’s wife! Surely I have mentioned before in my review on Murder on the Orient Express (2017) on how much I like her. She is beautiful and a great actress as well. That’s why I’m so excited to see her in Ant-Man and the Wasp. Her presence still enchanted me and her acting performance is still outstanding. She is just awesome. Not that the other actors and actresses in the film were not awesome. But one can always have a favourite, right? In terms of action scenes or superheroic moments, I don’t think Ant-Man and the Wasp has as much as other superhero films. This film seemed more personal rather than saving the world from danger. Well, I’m guessing with what’s happening in the Marvel Universe, they just could not take more enemies. I mean, it’s impossible to have another enemy when the major threat is already incoming. It would be very confusing not for the filmmakers, but also the audiences. Although the action and fighting scenes were not that much, we were provided with other aspects, like the humour and the science part. Since the conflict is more personal, the enemy is also not as destructive as other Marvel’s enemies. Ghost is dangerous and powerful enough to make Ant-Man overwhelmed, but not enough to endanger the world or so. Nor does the other enemy as well. That is why, Ant-Man and the Wasp doesn’t really feel like a superhero film to me. More like people with extra power who want something personal. Still, the story is enjoyable and fun. It is not Marvel films if they didn’t put some scientific process in their films. From biology to chemistry to physics, they have it all. Now, Ant-Man and the Wasp gave us some quantum realm. Even the words quantum itself already explains a lot about what’s going on in the film. However, it’s not as confusing as when you watched Interstellar (2014). Plus, Ant-Man and the Wasp gives you quite a fun laugh, so the audience can very much enjoy the show. Speaking of funny, though Paul Rudd has provided us with his ridiculous actions and such and made the audience laugh, it is Michael Peña who I think mostly made us laugh. His character is so funny that I think without him, Ant-Man and the Wasp won’t be as funny as now. I don’t remember which film that I have seen Michael Peña. Whether he used to play mean characters or funny characters or just so-so characters, I think Michael Peña did a great job in Ant-Man and the Wasp. He really suited in playing a ridiculous and funny character. Like all other Marvel films, you will get post credit scenes as well. There are two post-credit scenes. One in the middle, the other one is at the end. I won’t say which post-credit scenes that related to Avengers: Infinity War, but one of them is. In my personal opinion, the scene itself is kind of a key scene to the continuation of Avengers: Infinity War. Though, I don’t know if it’s true or not but I think it is. So don’t leave your seat too fast. All in all, Ant-Man and the Wasp is an enjoyable film to watch. It is unlike other Marvel films or any other superheroes films at any rate because the story is more personal, rather than about saving the world. Nevertheless, I did enjoy watching the film despite all of that. This film is fun and enjoyable. I look forward for Ant-Man’s appearance in the next Avengers films. I give Ant-Man and the Wasp 8 out of 10 stars.